It’s always interesting to pick up a Carolyn Parkhurst book, because you never know what you’re going to get. Whether it’s a fictionalized account of an Amazing Race-like reality show, a novelist re-writing her endings, or a rural compound for families of autistic kids, you’re in for a quirky but interesting ride. 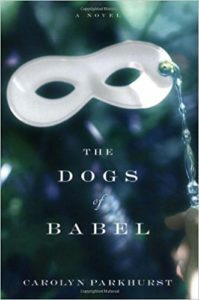 The Dogs of Babel, which I believe is Parkhurst’s first novel (it came out in 2004) is about Paul, a man whose wife Lexy is found mysteriously dead in their backyard after falling out of a tree. There were no witnesses other than their dog, Lorelei. With no explanation for why his wife would have been climbing in their tree, Paul, desperate for answers, decides to train his dog to talk so that he can get an answer from her. Much of The Dogs of Babel is told through flashbacks as we learn about Paul and Lexy’s relationship. Paul is a straight arrow, while Lexy is artistic and impulsive and prone to violent outbursts and mood swings. But we grow to understand why he loved her and what a void she has left in his life. As the complexities of their relationship are slowly revealed, the answer to the question of what happened to Lexy becomes less murky. So the talking dog part of the book sounds weird, but Paul is a linguist, so his interest in interspecies communication isn’t that strange. He grows interested – warily – in a fringe movement to get dogs to talk. The leader is in prison for maiming and torturing dogs – that part is awful – and Paul knows that the remaining men in the group are cruel and disturbed. But he’s so desperate to get Lorelei to talk that his judgment gets clouded and he interacts with them a little, but with tragic consequences. Ultimately this is a story about grief, not unlike the last book I reviewed, Goodbye For Now by Laurie Frankel. What lengths might we go to to soothe the pain of loss? At what price? The Dogs of Babel wasn’t my favorite Carolyn Parkhurst but I still liked it and was eager to learn what happened. She’s a very good writer and I’ll probably read anything she puts out. I’ve heard her speak a few times (she’s local) and I am definitely a fan. Posted on December 18, 2017 by gayle. This entry was posted in Fiction and tagged carolyn parkhurst, dogs of babel. Bookmark the permalink. I read this book back in 2004. Because it’s been so long, I don’t remember the book well. I do know that I wasn’t impressed with it because I gave it only three stars (out of five ).